Hi Everyone! Its Dallas and I thought it would be fun to share another guest post with you. This is such an easy, go-to recipe! First, you get all your ingredients ready. 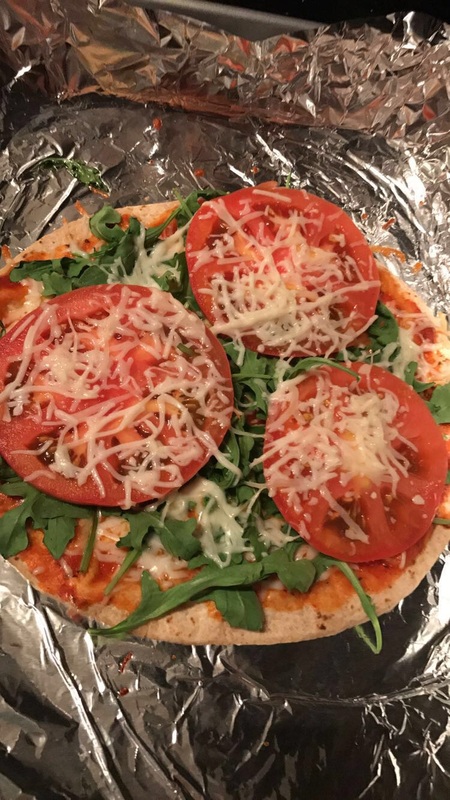 For this pizza, I am making a red onion, arugula, and tomato pizza. I make the same pizza with chicken or pepperoni. You can make this pizza with whichever toppings you would like. First, we get our tortilla on the pan. I use tinfoil on the pan for an easier cleanup. I put my oven on low in the broil section. I flip over the tortilla during this process. I probably have it in there for 2-3 minutes per side. You can do it longer or shorter depending on how you like your crust. Once you're done with that step, it's time for toppings. The next step is adding the delicious pizza sauce. I add about 1.5 to 2 tablespoons of sauce. I added the cheese and arugula next along with some delicious chopped red onion! I sliced up some tomato and placed it on my pizza. I bought this tomato from the farmer's market. It looks so delicious. Next, I added some cheese on top. After all the toppings are on the pizza, I place it in the oven at 350 degrees for 7-8 minutes. I keep my eye on the pizza seeing when the cheese melted as well. This pizza is not only delicious... it is cost effective!